If you want to talk compound you need to know what you’re referring to. 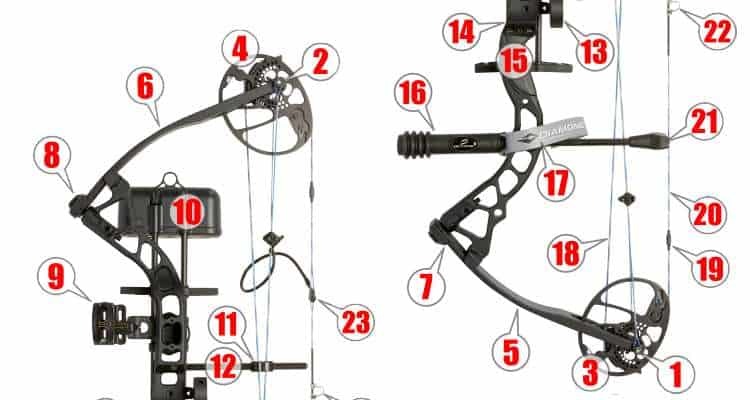 In this article we’re going to illustrate and explain the various parts of a modern compound bow. What they do, where they are and why you should know. If you want to dig deeper we’ve a more in-depth article which explains specifications, cam types, back walls and other features of compounds and why they matter. If you’re wondering, our example bow is the feature packed Diamond Infinite Edge Pro in BlackOps finish. This is the main body of the bow. The riser has most of the mass and provides the mounting points for accessories such as sights, stabilizers and a quiver. You’ll normally find modern compound risers made out of aluminium although high end and low end bows can use different materials to lower weight or cost respectively. ​The riser is where the limbs attach and it’s also where you hold the bow. The riser has to provide the stability for all the other components of the bow to flex against. The axle is… well it’s the axle on which the cam turns. You might think of this as the hinge or load bearing point for the cam. The distance between the top and bottom axle of a compound bow is called the ‘Axle-To-Axle’ distance and is usually outlined in bow specifications. The thing that differentiates a compound bow from any other bow are the cams. These are located at the ends of the limbs and look like little wheels. Cams​ can have different types such as single, dual (which the example bow has) or hybrid. Their purpose is to transfer and store energy away from the string. This is called let-off, and this feature of a compound that means when the string is fully drawn you get a more powerful shot than the actual weight you are holding back. For example on an 70 lbs bow with 70% let off, the archer needs only hold back about 49 lbs of weight and the bow will provide 70 lbs of force to the arrow upon release. Read more on this here. At the top and bottom of the bow are the limbs. These are the pieces of the bow that flex and that flex provides the power for the shot. Limbs can be either single piece or split (2 piece). Split limbs offer durability, strength over single piece limbs however can introduce issues such as riser torque if they are inexactly matched. Normally limbs these are constructed out of a composite laminated material which can consist of wood, fiberglass and carbon. Solid glass limbs are also available. Limbs are usually attached to the riser by means of sliding into a limb pocket and being secured by a bolt. This bow is fitted with a pin sight which is an adjustable aperture with aiming pins through which an archer can aim. This bow is fitted with a quiver. Not all compounds are fitted with these by the manufacturer so don’t always expect to see one. Most risers will come with attachment points for a quiver even if one isn’t supplied. On this example the tips of the arrow will fit into the top of the quiver so that the arrow would point upwards and be stored pointing upwards seemingly (you might think) upside down. Quivers can be fitted​ the other way up, this is usually a personal preference thing. The cable slide is a movable retaining slide that keeps the cables out of the way of the arrow whilst a shot is taken. The cable guard is the pole attached to the riser that the cable slide attaches to and slides along. The rest that holds the arrow in place. There are a few different types of rest. They can ‘drop away’ after shooting and there’s one called a ‘whisker biscuit’ that holds the arrow in place with whiskers. The shelf is located just above the grip and on a traditional bow can be used to rest the arrow on during a shot (much like an arrow rest). Most compound shooters use a rest. This is where you hold the bow. Grips are normally ergonomically fashioned on modern bows and may be slightly cushioned or coated with tactile materials to assist in keeping the bow firmly in your hand when shooting or carrying it. Stabilizers are optional and act to give the bow stabilizing balance when fully drawn. They usually screw into a mounting hole on the riser. They can help to resist twist or torque in the riser when a shot is fired and add weight below the grip of the bow. Understanding how a stabilizer works is easy. Stand up and with your arms to your side, twist your torso. Easy? Now hold your arms straight out in front of you, keep them there, and twist again…. Gets harder doesn’t it? A stabilizer acts like your arms, and helps to stop the bow from twisting from side to side when the shooting forces are released. The additional weight of a stabilizer also helps to alter the center of balance of the bow at full draw, settling it quickly during the aiming process. You don’t grip a bow, and if you hold and fire a bow correctly (without a sling) it will fall forwards and out of your hands. A sling wraps around the back of your hand and stops this happening. These cables run from cam to cam and are part of the workings of the compound bow. They do not touch the arrow. Little weights added to the bowstring called ‘speed nocks’ that help to decrease the oscillations in a string as it is pulled by the cam during arrow release. This makes the string return to the groove in the cam more quickly. Less energy is lost in string oscillation and friction and this increases the speed rating of the bow. The string that you pull and that shoots the arrow forward. The vibration arrester stops the string from vibrating once fired. Imagine a bow like a harp with one string, if you released the string it would ‘twang’. The vibration arrester is make of rubber and stops that vibration making the shot quieter. This is useful when hunting. The arrow nock will rest on the face of the D. The bend of the D will be hooked onto a mechanical release aid. There are different types of release, thumb, wrist, trigger and even back. A release aid allows for a clean release of the string without any sticky fingers to affect the path of the string. This peep sight is a ‘tube’ sight as it has a little tube attached that, when at full draw will allow the archer to sight down it. Bow sights are similar to sights on rifles, there are 2 things you need to align. The main sight on the bow has pins and you sight those pins to the target through the peep. I hope this helped clear up any confusion you may have had when looking at compound bow and helped you understand things a little more clearly! We’ve written a more in-depth guide to the ﻿various aspects of compound bows which you might also like to take a look at. If there’s anything we’ve missed or you’d like detailing further, please let us know in the comments. Angled vs Straight Spotting Scopes – Which do you need? What’s the Best Spotting Scope for 100 Yards? What do scope numbers mean? What’s the Best Rangefinder on a Budget?